We are a “Healthy School” and encourage our pupils to think about the benefits of a balanced and healthy diet. Children are allowed to bring a snack or a drink for morning break and we ask that parents provide healthy snacks – fruit, bread sticks, cereal bars. Children in Key Stage 1 (Reception, Year 1 and Year 2) receive free fruit from school. Each half term parents are able to order and pay for a daily 1/3 pint of milk for their child to have at break time. Children under 5 receive this milk free. Children are also encouraged to bring a plastic bottle of water to school. It has been proven that if children have regular access to water during the day, they are more able to concentrate. These bottles are kept in the classroom and can be replenished in school from a central water dispenser. At lunchtime all of the children eat together in the hall, with the older pupils helping the youngest. All Key Stage 1 children are provided with a meal free of charge and we encourage parents to take up the option of a hot lunch provided by our catering company. 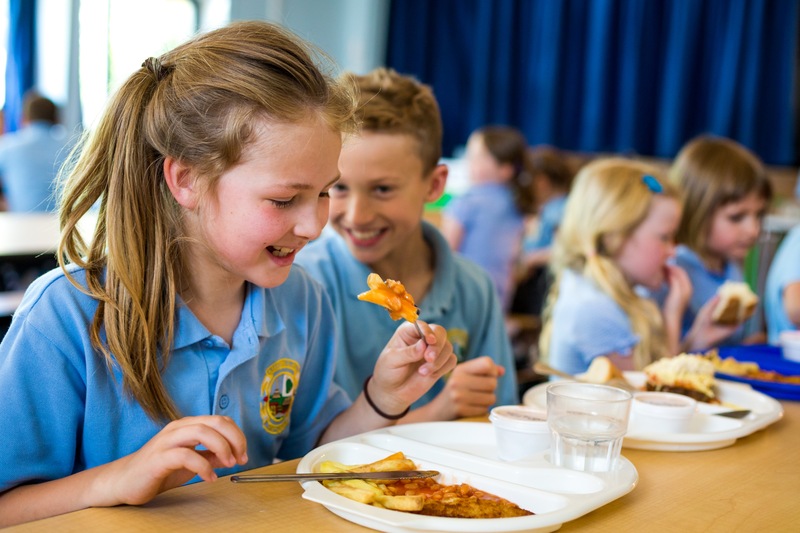 Please enquire at the office if you think your child is eligible for free school meals whichever Key Stage they are in as this entitles you to additional funding known as Pupil Premium.